Incorporating both a fridge and freezer into one tall unit ensures that you won’t have to traipse out to the garage or under the stairs to retrieve your frozen food. But most importantly, fridge freezers usually come with a wide variety of different features to make your life easier. These include auto defrost, which will save you the hassle of periodically defrosting your fridge, and anti-bacterial coating to help improve the hygiene in your fridge. In addition, some fridges freezers will come with a wine rack or bottle holder, while most come with an egg rack and separate compartments for your fruit and vegetables. 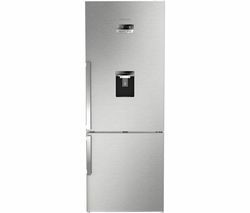 The latest contemporary fridge freezers also have other useful features, such as chilled water dispensers and fast-freeze functions that are all tastefully encased in a sophisticated, brushed steel body. Or if you’re not too fussed by all the fancy extras and just want an efficient, reliable, cheap fridge freezer, we have a selection of those too. The Currys PC World range includes all of the top brands including Samsung, LG, and Smeg Fridge Freezers. 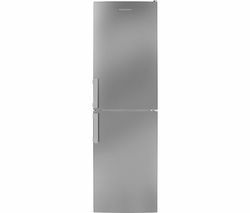 You can even get yours in a variety of colours, including silver, white, graphite, stainless steel, and black fridge freezers. So find your perfect fridge freezer at Currys PC World now! Find out all you need to know about chillers from our Buyer’s Guides to Refrigerators, freezers and chillers.